If you landed on this page, you’re probably interested in finding gifts for golfers under $50. It can be tough to buy affordable gifts for golfers, since most golfers already have the essentials (clubs, tees, gloves, etc.). As a golf course owner, I thought I would use my expertise to make some suggestions. This is not an exhaustive list, but it does include a few options that golfers will appreciate. Scroll down to see my selection the best golf gifts under $50 or view the table I’ve included below for quick scanning. Obviously, there are 1000s of gifts to consider when shopping for the golf enthusiast in your life. What I’ve tried to do is highlight five gifts that fit a variety of personalities and preferences, while still standing out from the crowd. Summary: If you don’t know anything about golf balls, here’s what you need to know — the Titleist Pro V1 are like the Mercedes Benz of golf balls. These balls cost several dollars each, so when a golfer pulls a Pro V1 out of their bag, it tells their companions that they mean business (or they don’t mind losing a $4 ball in a water hazard). If you can’t justify spending this much on a dozen golf balls, you can go the cheaper route and purchase refurbished Titleist Pro V1 golf balls at a fraction of the price. These are my favorite golf balls. These are the only golf balls I want in my bag. Better golf balls than any other brand. Summary: Golfers tend to own lots of equipment and accessories. Unfortunately, these items are sometimes tough to organize. That’s where the Samsonite Golf Trunk Organizer comes into play. This is the #1 golf trunk organizer on Amazon with over 400 reviews. Highlights include waterproof backing, movable dividers, and good breathability (for shoes, gloves, etc). The bag can be used for other purposes as well. Helps keep my golf stuff organized. Great for the times I decide to golf spontaneously or forget something at home. Summary: Precision shots make a huge difference in the world of golf. When you purchase a chipping net for a golfer, you give them a chance to practice key skills in the comfort of their own yard. There are a variety of chopping nets available online, but this one is easy to set up and take down, which is why I’m highlighting it here. It also has three chipping baskets which help golfers measure their precision. Perfect for working on your short game. A great affordable chipping net. Summary: If you’re looking for unique golf gifts under $50, the Gyroscopic Wrist and Forearm Exerciser fits the bill. This unique device is used to build up wrist, forearm, and finger strength — all components that can contribute to a better golf swing. This exerciser includes an LCD screen that records important workout information. Constructed with an impact resistant, military grade plastic shell. Better results than physical therapy. A great exercise tool for golfers. Summary: If you’re shopping for someone who can’t get enough of golf, a practice cup and flag stick should be well-received. This setup is perfect for target practice in the backyard, a local park, or any other green space. 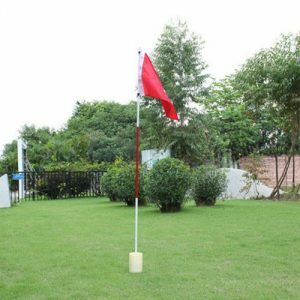 For golfers who have tons of yard space, you can purchase a few of these cup/flag sets so they can set up multiple holes on their property. Great giftt…don’t know why I didn’t think of it sooner. Summary: If you’re worried that the options above won’t work, then you should fall back on a funny golf t-shirt. 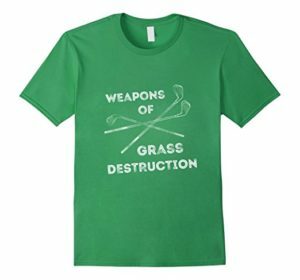 Amazon has a ton of great options, but my suggestions would be either the Weapons of Grass Destruction shirt, the “How’s My Driving?” shirt, or the Sir Shanks Alot shirt. Both of these t-shirt will generate laughs and they are available in multiple color schemes and sizes. If you’re the type of person who wants more than five choices, there’s a few ideas that I didn’t include in my final rankings. Take a look at these ideas below. Do you have some gifts for golfers under $50 that you’d recommend? Please post them in the comments below. Or, if you’re looking to spend less, check out our cheap golf gifts under $10.